Today there are a number of countries that have implemented regulations and policies that ensure that their fisheries are as sustainable as possible. We will highlight some of those countries here and provide insights into the policies that are proving to be effective; these vary from public education to sustainable practices stemming from the fishing industry itself. Norway’s Fisheries are currently offering a sustainable fish supply to U.S. markets. New England’s dwindling cod supply has been forcing U.S. chefs to look elsewhere for cod. The New England Fishery Management Council has slashed current cod quotas by more than 50 percent for the Gulf of Maine and Georges Bank; this in effort to halt the complete disappearance of the species from the region. As with the Grand Banks off Newfoundland, overfishing is blamed for the depletion of the local cod. The Norwegian Seafood Council is able to fill the void due to its own sustainable processes for catching local cod. The council promotes the use of skrei, a seasonal Norwegian cod that migrates from the Barents Sea to its spawning grounds off Norway’s north coast. In order to be labeled skrei, strict conditions have been put in place. The cod must be caught wild and full grown, between January and April, and packed within 12 hours of being caught. In addition, the fish must have no imperfections, such as nicks or bruises. This takes extra policing on the part of the Norwegian fisheries; however, it appears to be working in terms of sustainability. Norway’s sustainable fishing operations make them the world’s second-largest seafood exporter, behind only China. The country enacted regulatory controls in 1816 to ensure skrei’s longevity. Over 400 million cod migrate annually to the coast but only 10 percent of those caught qualify as skrei. The remaining 90 percent are thrown back into the Barents Sea so that the species can be sustained. All skrei is Marine Stewardship Council certified. 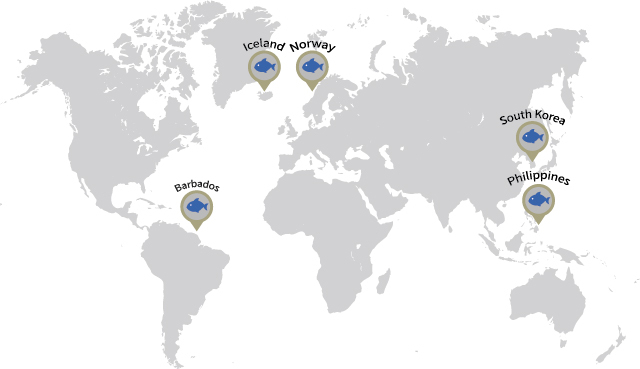 Norway is also being touted for its sustainable salmon and halibut aquaculture program. This program combines the country’s natural asset of cold, clear waters with strict regulations to monitor the health and safety of fisheries. The fishing industry is a vital source of food and jobs for Barbados, but in the late 1970s, habitat degradation and loss of fish population threatened fisheries. In 1995, Barbados implemented the FAO Code of Conduct for Responsible Fisheries to address these issues. The changes were extensive and they have been beneficial to the fishing industry. Marine life in the area has rebounded. The changes included establishing principles, in accordance with the relevant rules of international law, to promote responsible fishing and fisheries activities. The fisheries are examining all the relevant biological, technological, economic, social, environmental and commercial aspects. This will allow them to establish principles and criteria for the implementation of national policies for responsible conservation of fisheries resources and fisheries management and development. Barbados has also worked to facilitate and promote technical, financial and other cooperation in the conservation of fisheries resources and in fisheries management and development. This includes promoting the contribution of fisheries to food security and food quality – as well as giving priority to the nutritional needs of local communities – while also promoting the protection of living aquatic resources and their environments. Finally, Barbados is working to promote research on fisheries and their associated ecosystems as well as on relevant environmental factors. This will allow the island country to provide standards of conduct for all persons involved in the fisheries sector. These changes have had a lasting effect on the fishing industry in the area, as well as on its marine environment. Native marine species have been protected and the country’s fishing industry has remained intact, proving that policies that support sustainability can be effective. South Korea is another country that is taking the lead in establishing sustainable fisheries. South Korea and the Food and Agriculture Organization have agreed to work closely together to promote responsible fishing and aquaculture in the developing world. South Korea’s Vice-Minister of Oceans and Fisheries, Jae Hak Son, and FAO Assistant Director-General, Maria Helena Semedo, signed a Memorandum of Understanding agreeing to work together to build the capacity of developing countries to address key issues related to fisheries and aquaculture and promote compliance with the FAO Code of Conduct for Responsible Fisheries. The FAO-South Korea initiative covers a broad spectrum of policy, governance and management issues in fisheries and aquaculture. The livelihoods of millions of people depend directly or indirectly on fisheries and aquaculture. Fish is the primary source of protein of 17 per cent of the world’s population. South Korea is taking an active role in ensuring that not only are its fisheries sustainable, but that it is actively helping others follow suit. Iceland is famous for its fish and has become the poster country for developing a quota system for its fishermen, which ensures responsible and sustainable fishing and responsible fishing practices. Iceland began sea limiting in 1901, marking off a zone that could be fished by Icelanders alone. It began as an area of 3 miles, but by 1976, it had expanded to 200 miles. Protecting the diminishing stocks of cod and haddock was determined to be important at the time – and for Icelanders, it made sense to develop limits. Icelanders also adhere to fish limits. The amount of fish that each fisherman can catch is regulated. In 1995, a workable system of quotas was introduced and the total cod catch was restricted to a maximum of 25% of the estimated stock. Still in place today, each vessel is allocated a certain share of the total allowable catch of the relevant species. Twice a year, in spring and autumn, scientists re-evaluate these quotas after testing the biomass. Fishing grounds are temporarily shut down if stocks fall. This approach has proved so effective, that in 2010, Iceland was awarded its own marine stewardship label certifying its responsible practices. The Tagbanua people of the Philippines have traditionally employed fishing practices that simultaneously allow them to harvest and maintain fish populations – practices which they continue to adhere to today. Tagbanuas fish for specific species only during certain times of the year – times they determine by the observation of the tides and the moon – thereby allowing fish stocks to replenish themselves. The Tagbanua people have also set aside certain areas, such as coral reefs, as protected spots in which fishing is prohibited. When they do fish, these traditional fishers primarily use hook-and-line methods, catching only what they need to feed themselves and their communities. This is by far the most successful way to ensure sustainability.